This Event Has Now Finished. To Find Out About Current Classes, Please Look In ‘Classes’ On The Home Page. Summary: Over the duration of the course, the group will participate in writers workshops to develop their writing skills. We will focus on short story writing, but will look at script writing as well as novel length work. This course encourages students to write about the world they know and to create fiction out of their own experiences. All 12-25 year olds with all skill levels are welcome to join. If you require transportation, we provide a free taxi service. Please get in touch with us by phone to arrange transportation. * Please note, every student is required to have a signed consent form to attend the class. These forms can be collected at the first class, or Click To Download. Any persons under 16 needs a parent or guardian to sign, and anyone over 16 is able to sign for themselves. 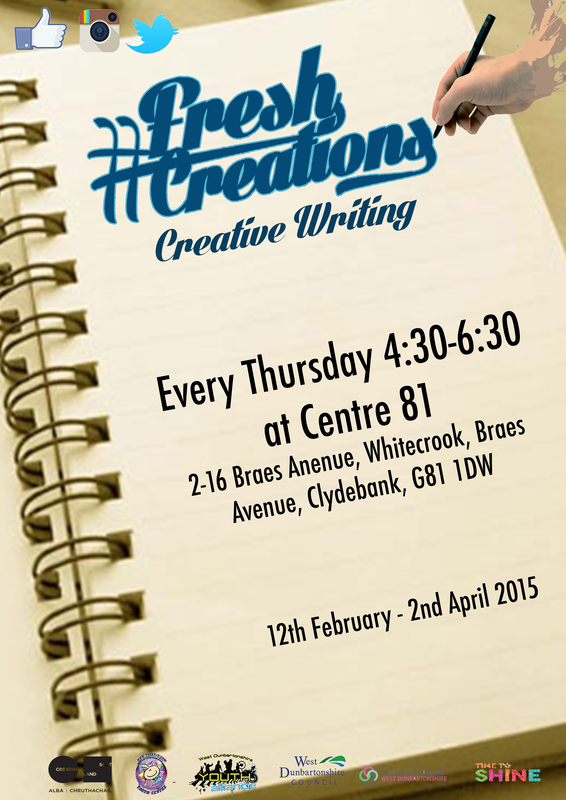 For any inquiries please get in touch at info@fresh-creations.co.uk or call 0141 941 3308.